Talking Phrasebook is a simple and useful app that translates the most important sentences and words you need while travelling through West Europe. There are 7 languages you can translate to: English, German, Spanish, French, Dutch, Italian and Portuguese. 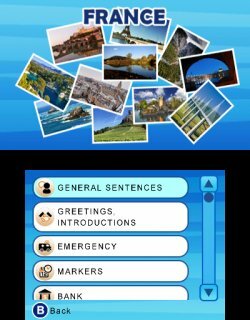 You can select from a total of 788 phrases which are divided into General Phrases (41), Meetings/Greetings (54), Emergencies (51), Time (85), Bank (15), Food (62), Mail ( 8 ), Weather (14), Sightseeing (41), Travelling (58), Shopping (52), Restaurant (146), Hotel (65), Airport (95), and Favourites. It seems there is all the necessary content available that you need for getting around and avoiding trouble. Navigation is very simple as you can use the touchscreen or buttons. Each phrase, vocabulary, or sentence has an audio file you can listen to. The quality is obviously not the very best as this is a relatively small download and no CD software, but it does it's job well enough. Though you'll want to use headphones when you're outside or in a noisy place. You can also put each phrase into your Favourites folder for excerise. Unfortunately there is just one folder, so you cannot customize it for different occasions. Also, you cannot sort them by yourself. It's good enough for taking a bunch of phrases you want to learn, but nothing more. There is not much to say about the audiovisuals. The title screen has two minutes of calm elevator music, and the top screen shows postcards of the country you've selected. It has the basic presentation that is needed to be pleasing enough without coming off as sterile. While reviewing this I came across a minor spelling mistake. Normally not a big thing, but in a language app it's distracting. However, since it was just one word it's ok though and doesn't take away from the final score. All in all it's a quite handy app, not just for travellers but also for people that want to learn the basics of getting around in a foreign country. This app seems like it could be useful! Excellent work as always SKTTR.